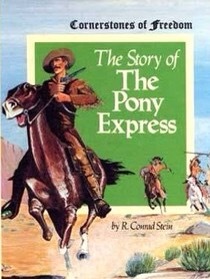 Given the anniversary and the coverage, it’s a good movement to offer a few historical tidbits about the Pony Express. First of all, the Pony Express was a private mail service. It didn’t have a direct connection with the U.S. Post Office Department, for which it was still too expensive to create a transcontinental post route in April 1860. As a private contract route, it occasionally carried U.S. Mail, but the system was really designed for promoting business and commerical correspondence to the new and rapidly growing state of California. For that reason, the rate structure was prohibitively costly for most personal correspondence (you’d have been better off sending a letter via ship around South America, if memory serves). The Pony Express also had only a short history. A year after it began its service, the Civil War began, which put a crimp in business, and a few months later the first transcontinental telegraph was completed, rendering the Pony Express an expensive and relatively slow method of transmitting business messages across the Plains and the Rocky Mountains. Since its demise in the fall of 1861, the Pony Express has obviously taken its place in the public imagination, and that’s fine. And if Google would ever like to add more postal history to its Doodle roster, I’m happy to consult. We have Buffalo Bill’s Pony Express pistol – interested in story?